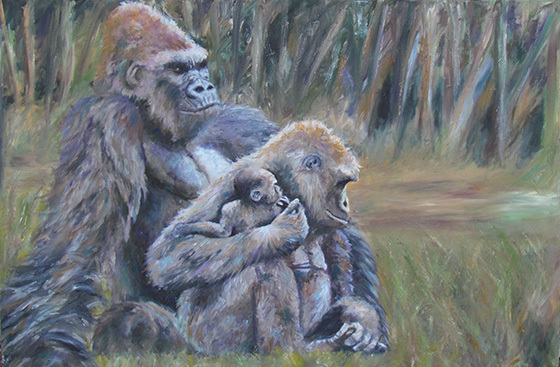 Nothing to Fear, Western Gorillas in oil by Melissa Santich. All Rights Reserved. I am a relatively new artist working every day to become more creative and skilled. I paint in all mediums, and this particular piece is done in oils. I love painting animals and I took this photo myself. I waited a full year to paint it because I wanted to do it justice. I chose to maintain the realism of the photograph while adding interesting colors and expressive brushstrokes. I was hoping to capture the mood of the scene, particularly the massive Silverback. I love painting.